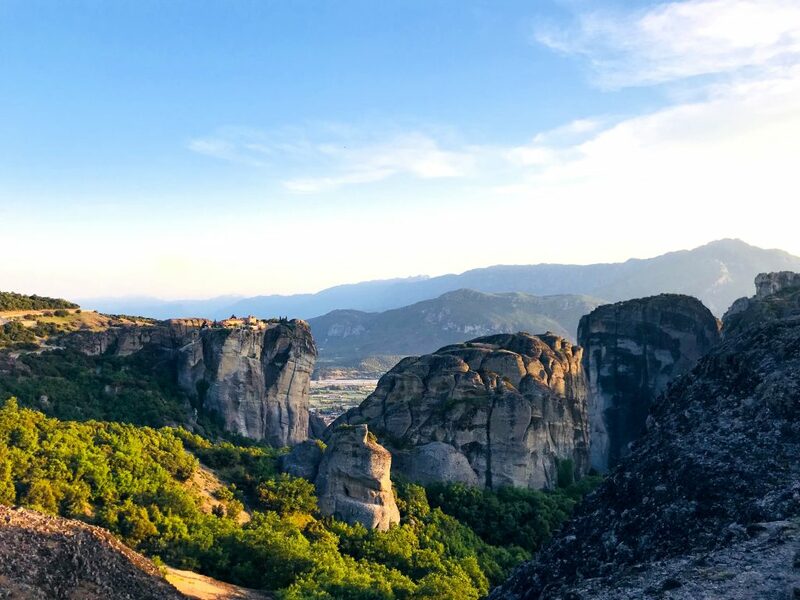 I have heard from other campers, that Meteora is must see place, but that it was more known and mainly visited by the Greeks. So I decided to drive two and half hours inland from Delphi to discover this place people say about it’s mystical. 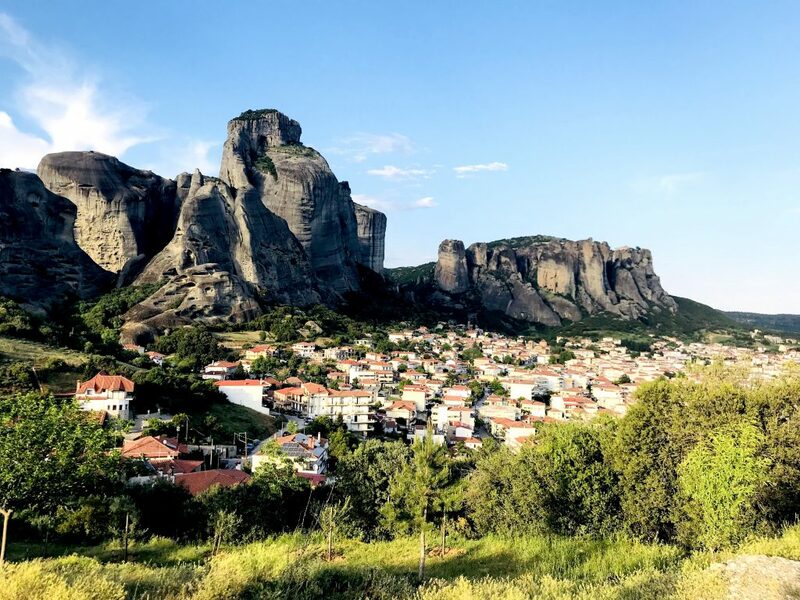 Driving with my motorhome towards the town of Kalambaka, Meteora slowly reveals itself as Fiete and I get closer. Wow! What a scenary! Serene, spiritual, magical, mystical, extraordinary, inspiring and impressive are just a few words to describe it. It really felt like being in the land of the Gods. We stayed at Camping Vrachos Kastraki, which is the perfect place to discover the area from as hiking paths and roads up the hills are nearby. Time to check out the area and orient myself. As I wasn’t quite sure where to even start, I decided to walk into Kalabaka and check out the tourist information center. Fiete and I were accompanied by a lot of stray dogs on our way to the city center, but it went just fine. At the tourist information center, I decided to book a guided hike up the mountains and one bus tour at sunset. The owners of the providers were cool about Fiete coming with on the bus, which was great. Because the alternatives would have been to take the motorhome into the mountains, take the local bus for 1,80 Euros but no explanations around it or leave Fiete at the campsite, which is not really an option for me. Everyone on the bus loved Fiete and he made a lots of friends. We left very early in the morning for our hike through the mountains and visit some Monestaries. 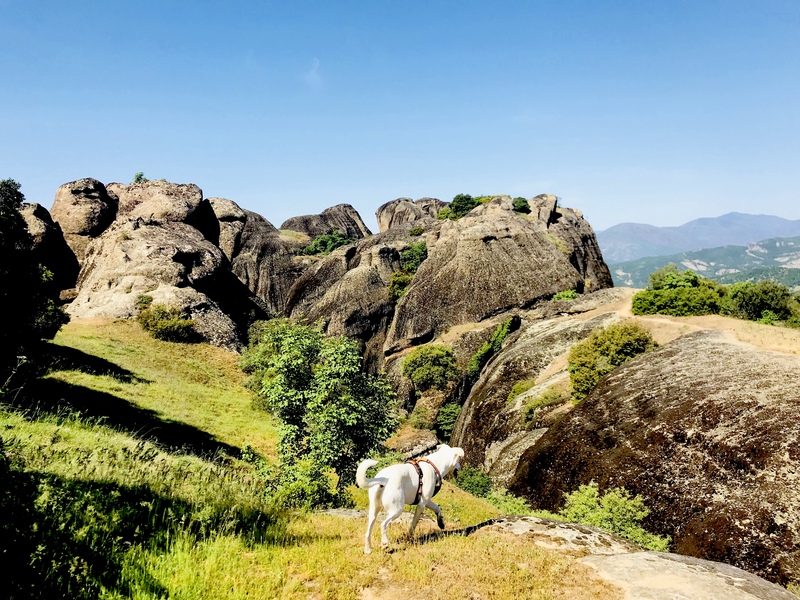 Fiete and I loved every step in this simply breathtaking landscape. These unique and enormous columns of rock rise precipitously from the ground. But their unusual form is not easy to explain geologically. 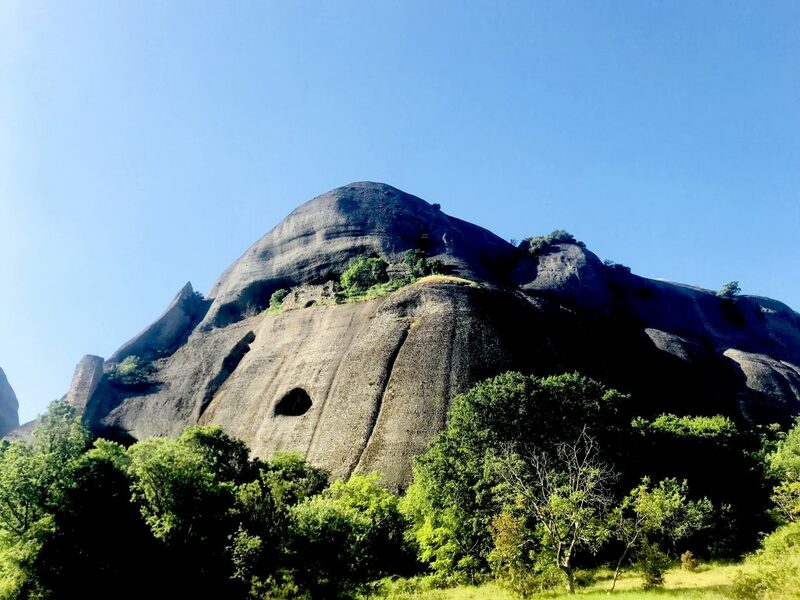 They are not volcanic plugs of hard igneous rock typical elsewhere, but the rocks are composed of a mixture of sandstone and conglomerate. Anyway, they are very impressive though. The hike started from the foothills of Doupiani rock, beneath the old ruins of Pantokrator monastery. 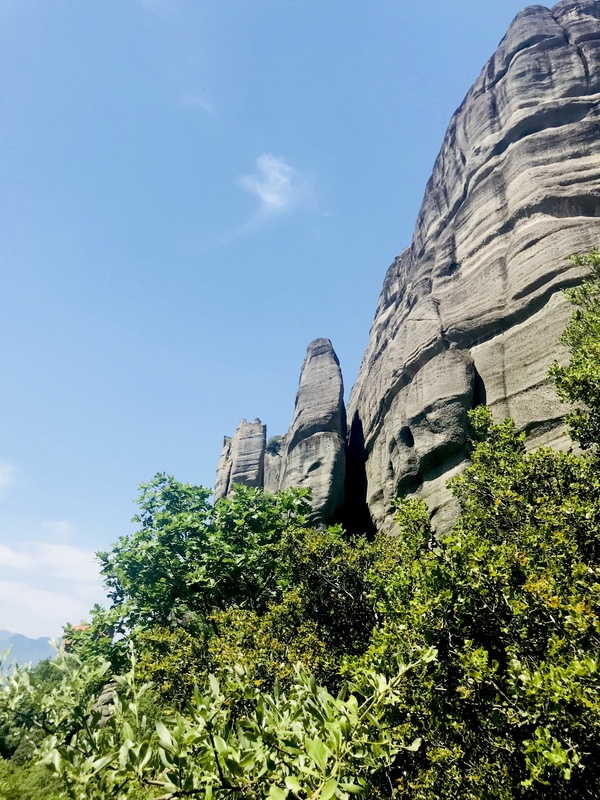 It then crossed through the immense rock formations to reach the Northern side of Meteora. Over that side, we discovered the hidden Monastery of Ypapanti and the ruins of St. Dimitrious. 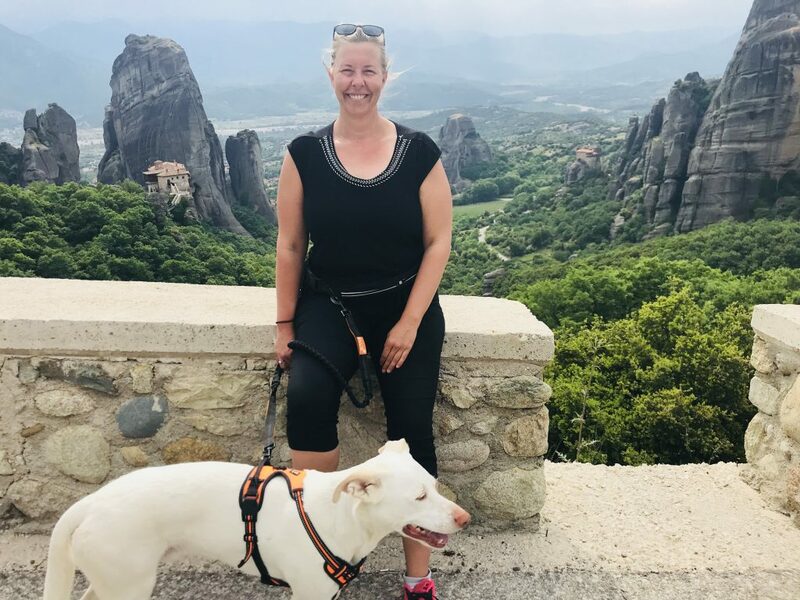 After a long and steep hike up the mountains with a fantastic view, we arrived at the Monasteries of Great Meteoron. This place really ticks the box. 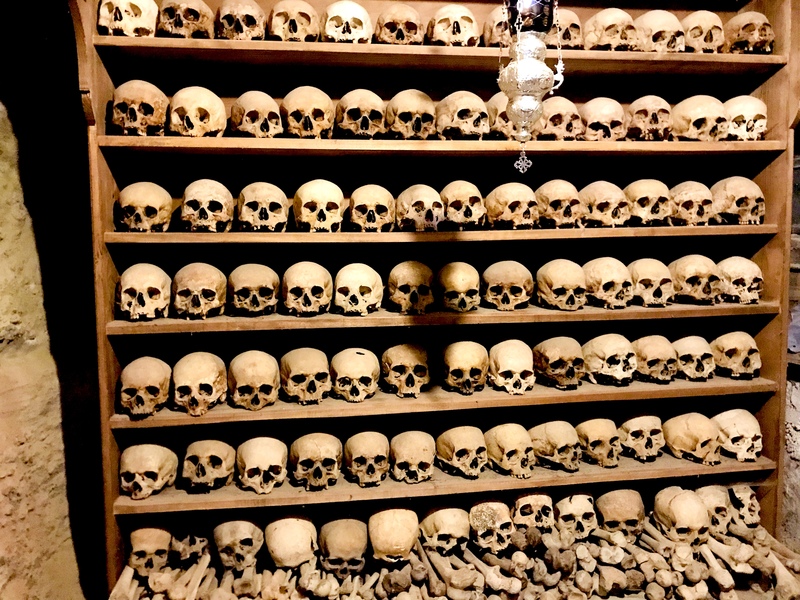 There are still monks living but you can visit the site seeing the church, the old kitchen, the library and also a cage with skulls from dead monks having lived at this Monestary – creepy! After visiting the site, we walked down the old footpath the monks used for centuries before the construction of roads for the last part of this hike. Phew – that was exhausting and we really needed a break. 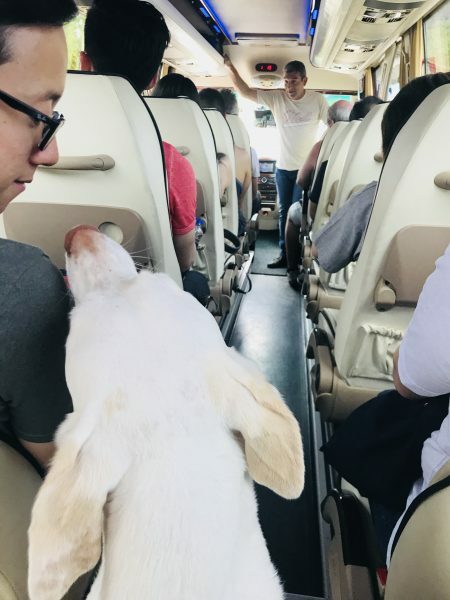 Good thing that the tour bus was waiting for us downhill to bring uns back to the campsite to chill for the rest of the afternoon. The next day was time for our booked sunset tour on the bus. Fiete and I were picked up at the campsite – how convenient. And then we left up into the mountains to discover the hidden gems of Meteora – the famous Monestaries. At their peak in the sixteenth century there were 24 Monasteries. They were created to serve monks and nuns following the teachings of the Eastern Orthodox Church. Much of the architecture of these buildings is Athonite in origin. Today there are six Monestaries still functioning, while the remainder are largely in ruin. Perched onto high cliffs, they are now accessible by staircases and pathways cut into the rock formations. Of the six functioning Monasteries, the Holy Monastery of St. Stephen and the Holy Monastery of Roussanou are inhabited by nuns while the remainder are inhabited by monks. The exact date of the establishment of the Monasteries is unknown. By the late 11th and early 12th centuries, a rudimentary monastic state had formed called the Skete of Stagoi and was centered around the church of Theotokos. 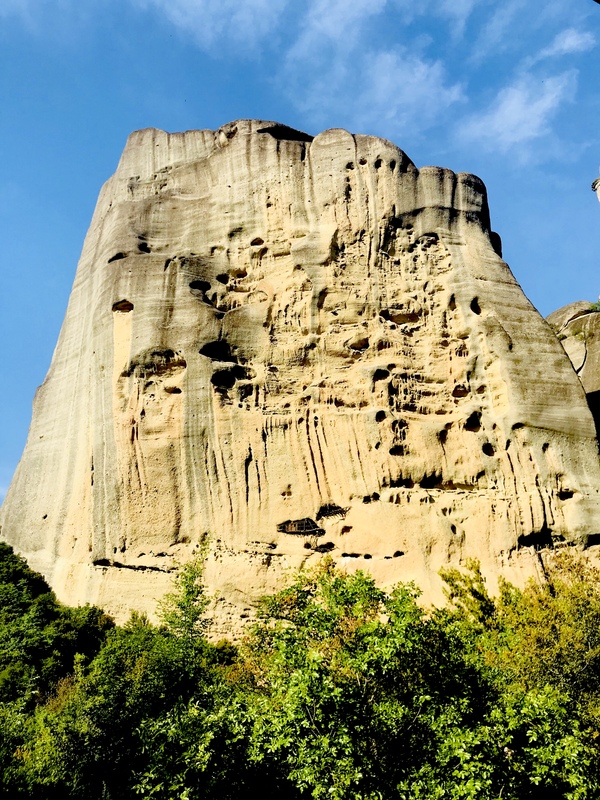 By the end of the 12th century, an ascetic community had flocked to Meteora. We started the tour with a visit to one of the 6 active Monasteries of Meteora, the Holy Monestary of St. Stephen. As it is an active Monastery, women have to wear long skirts. Pants, leggings, shorts or short skirts are not permitted. They do, however, provide skirt wraps for women to wear which can be found right at the front doors. 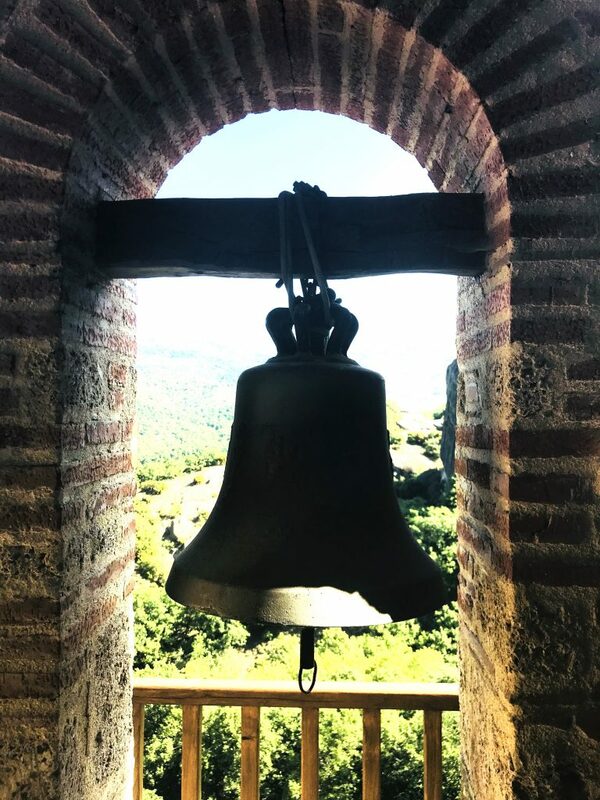 After that we drove to the oldest standing monument, the Byzantine church of Virgin Mary located in the old town of Kalambaka. A church made in the early Christian period with ancient marbles embedded on its walls, telling the town’s long history of 27 centuries. 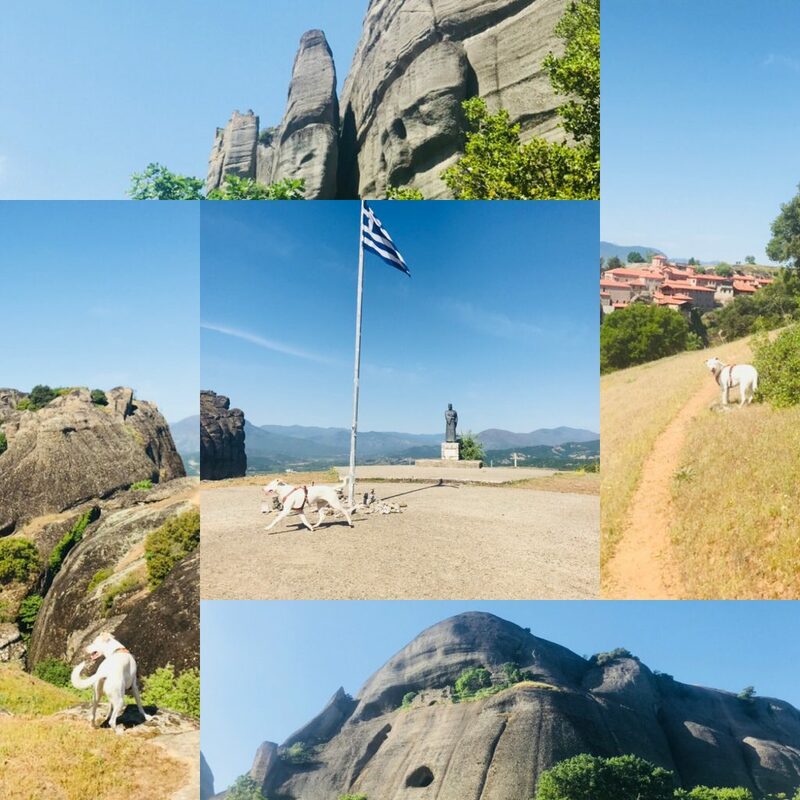 At a place close to the church, we enjoyed great views over Kalambaka. Going further up the mountain ranges, quite few of the holy Monasteries were visible from a distance. So high up in the sky, they appear untouchable and inaccessible. Really impressive. I could see almost each monastery, raised high up on the peaks of this gigantic stone forest that dwarfs the town below it. Game of Thrones fans might recognize this place as the backdrop for the aerial kingdom of Eyrie. 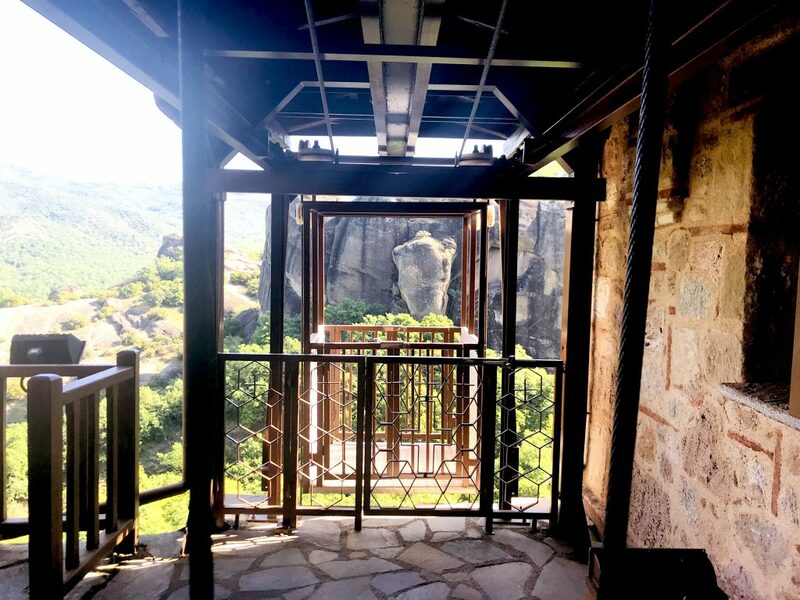 They never actually filmed the show in Meteora but the filming crew took some shots there to digitally insert as the backdrop of Eyrie. However, in the show, they added additional pillars and such to change the look. This was due to difficulty receiving rights to film there as Meteora is a UNESCO site and they wanted to protect the surrounding environment. 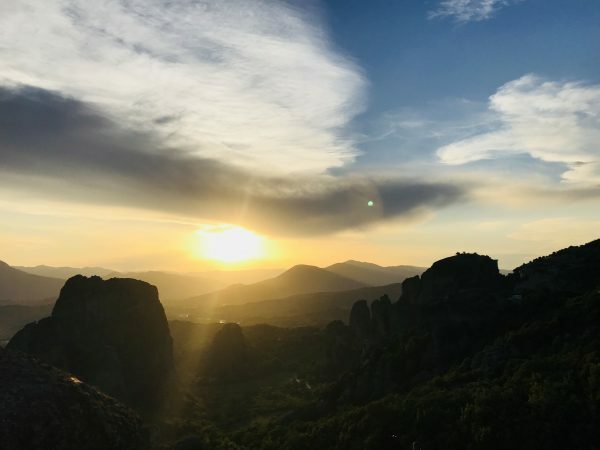 As the sun slowly began to descent, the bus took us to the mountain ridges high up on the rocks of Meteora, on a magical spot to enjoy the most captivating sunset views. 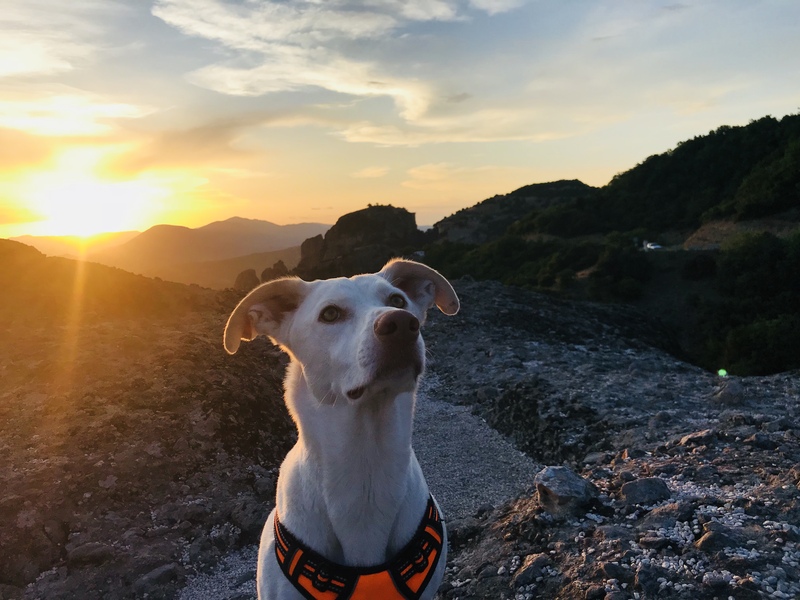 After a short barking attack at locals cats hanging out at the cliffs, Fiete and I were sitting on the edges and felt the evening breeze blowing. We enjoyed every moment of the dimming of the light as the sun sunk behind the mountains. 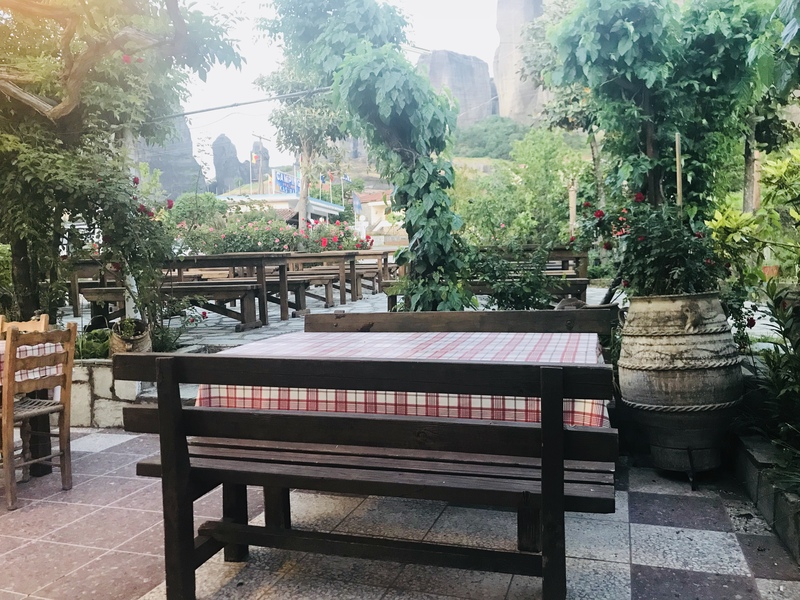 What a perfect way to end a beautiful day at Meteora with awe-inspiring moments we will remember forever. Next time you want to see a different side of Greece, go and explore its hidden mountain settlements inland. You will want to come back for more – I promise. This place is really mystical and worth to see. 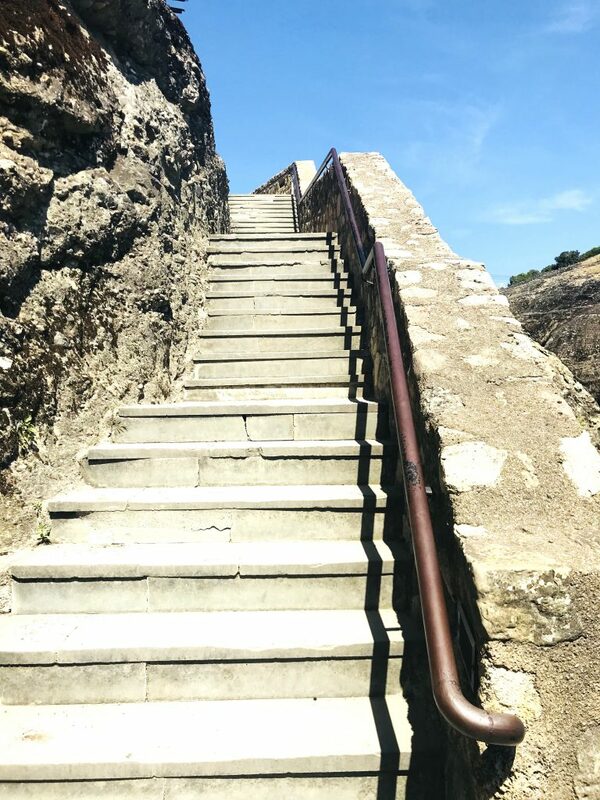 If you are visiting the Monestaries, please keep in mind that there is an entrance fee of two to three Euros per site, women have to coder their shoulders and wear long skirts as short ones above knees and pants are not being accepted here. 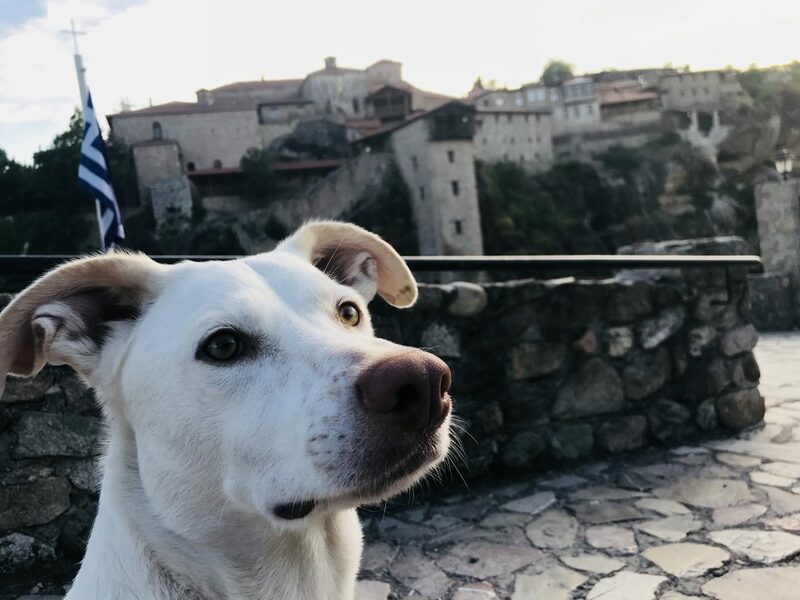 Dogs are not allowed in the Monetaries itself, but you can bring your partner on paws on hike paths. Fiete loved it. 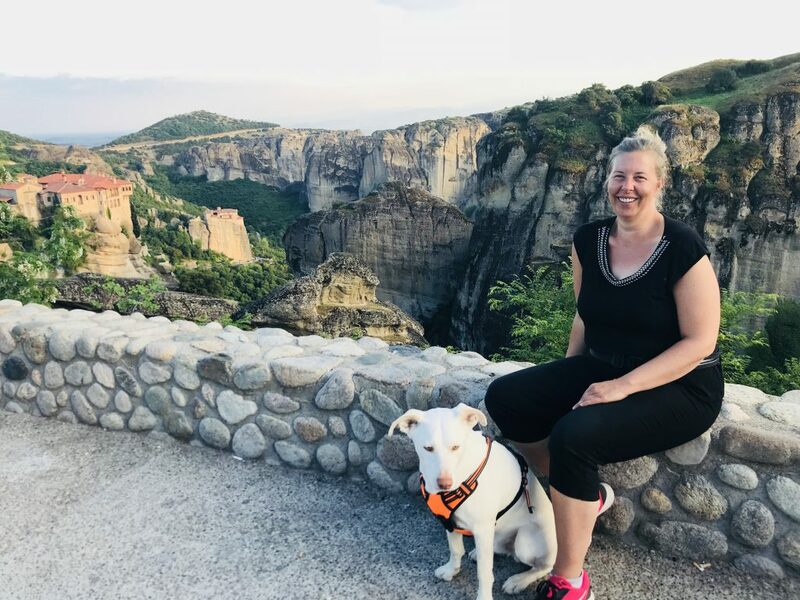 Meteora was our last destination before Igoumenitsa before we leave by ferry over to the other side of the Adriatic Sea – Italy! Stay tuned for our adventures “on the other side”.